The change of season is always an exciting time for gardeners sensitive to the habitat that they’ve created around them. Some birds, such as the swallows and swifts are preparing for long journeys across the oceans – just to return to the same spot next year. And that has been happening eons before the concept of a GPS was even contemplated. The behaviour of the paradise flycatchers can at the moment only be described as frantic. The red widows will soon be drab again and will be grouped with the LBJs. Most frogs seem to be getting lazy and a lot quieter for that matter. The pond is still alive with tadpoles that can very easily be confused with small fish. But for the chubby guys it is a different story. They require a secluded spot where they will simply dig themselves in for the winter. The ideal spot would be secluded from traffic with a nice mulch cover to ensure that the ground temperature stays fairly even. The lizards and geckos require some shelter under a rock or even a log that will protect them from temperature extremes as well as predators. In cold weather they are pretty lethargic and easy prey for anything with that sort of taste. So where does the avid habitat creator come into the picture you might ask? For frogs to hibernate, they need an exclusion area that should stay as undisturbed as possible. Do not pick up fallen leaves because they will provide part of the temperature regulating layer that is required by the frogs (and actually by many other small creatures as well). In spring, the earthworms will turn the leaves into compost for you while they are aerating your soil. When the frogs emerge they will find many appetizing tidbits in the decayed leaves and so will Burchell’s coucal. So please do not sweep away those fallen leaves, except from the stoep and the paving because you will deprive many creatures of a comfortable winter habitat as well as from a good start in spring. As for plants, there are quite a few stalwarts that can provide colour this time of the year, the most popular being Aloes. It is a more versatile group of plants than most people suspect. They vary in size from 20cm high to the big guys that can easily reach 4m or more. Some prefer shade and others sun. Your selection should be based on the size of your property and your taste. One of the most beautiful stemless Aloes is Aloe striata. An added bonus for those who still have pink feet to dote on, this Aloe is thorn less. 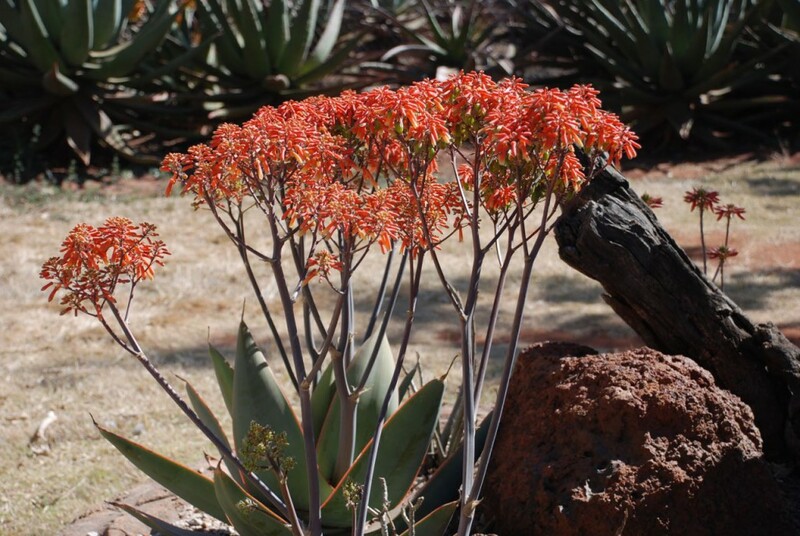 An Aloe that is really spectacular is Aloe pretoriensis. As the name implies, it was first discovered in the Gauteng area, but is locally almost extinct due to urbanization. Many nurseries are currently also selling some beautiful hybrids. If you require names of these nurseries, contact me. 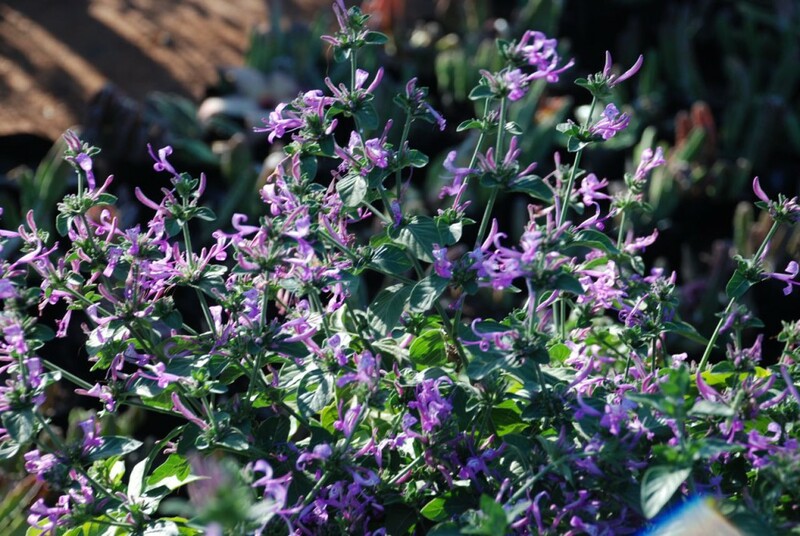 One of the plants that are in full flower this time of the year is Hypoestes aristata. It only reaches about one meter in height, but is now draped in mauve flowers. Frost might cut it down later in the season, but it will sprout again. It is equally happy in sun or semi-shade. Prune it back in spring to regain the nice shape. For a shady spot, consider Freesia grandiflora. 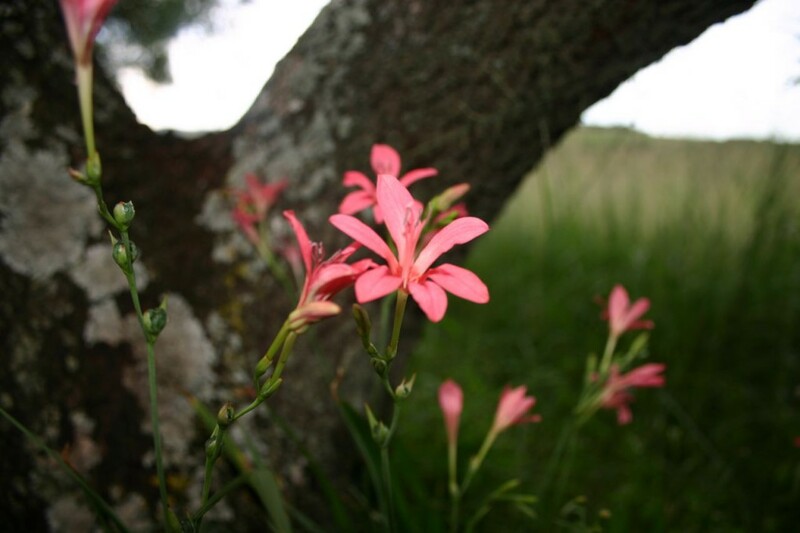 It is one of a few Freesias found in the summer rainfall area but still behaves like its cousins in the Cape. The Kniphofia species are also very hardy with few natural enemies. They flower either in winter or summer and range in size from 20cm to two metres (inflorescence included). Most are very frost hardy. Cut them back after flowering. An unusual one that is now flowering is K. multiflora. 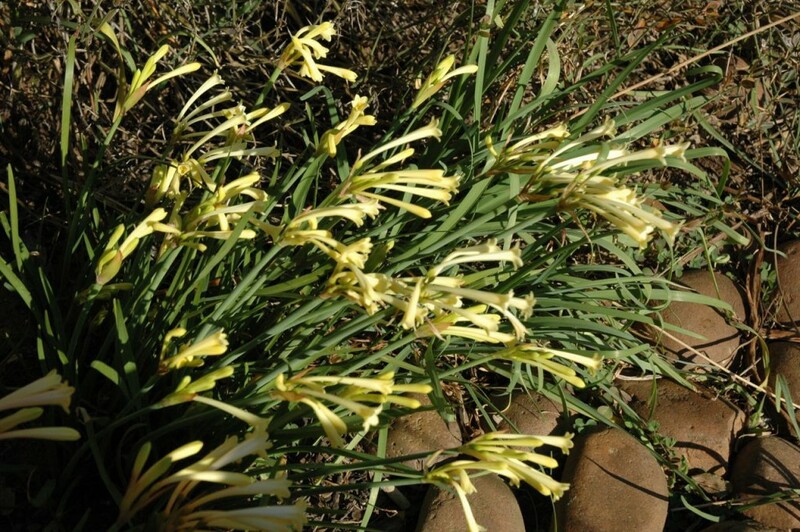 For a mass display in a small area, few plants will beat Cyrtanthus mackenii, the Ifafa lily. The dominant colour is usually yellow, but it can vary from apricot to red. Again, acquire them when they are in flower because then you can select the colours that you like. They produce flowers for about two months and are evergreen. A lily than can be used to great effect is Veltheimia bracteata, the Bush lily. 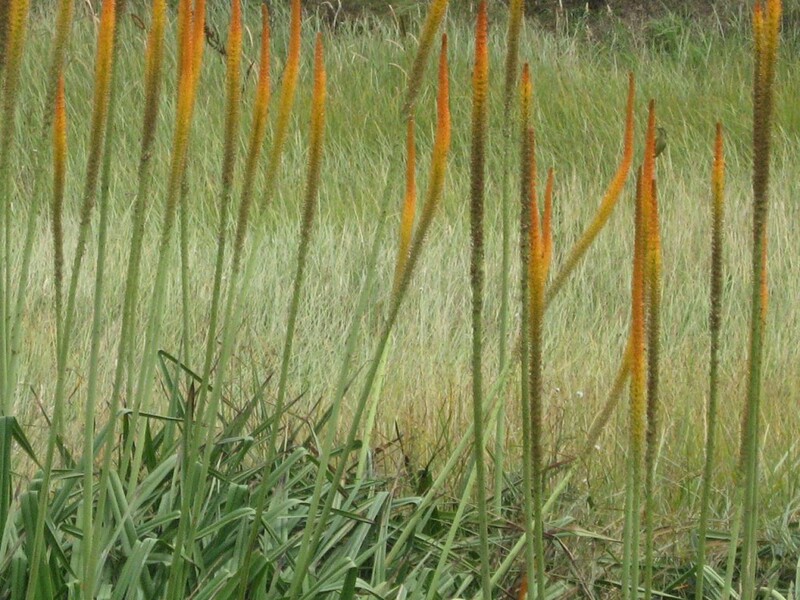 It occurs naturally on the fringes of forests, especially in the Eastern Cape and the flowers are reminiscent of a small Aloe. Plant it in semi-shade.